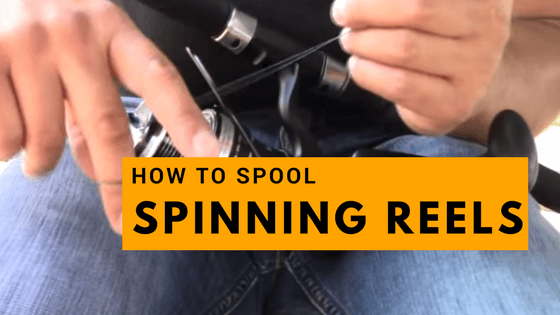 The one thing that fishing enthusiast usually finds a challenge is how to spool a spinning reel. You would expect directions on how to do that on every box of fishing line, but unfortunately that not the case. Other than that, most guides I have come across on the internet and different TV show are more confusing that educational. That’s why I have taken upon myself to give you few tips on how to spool a spinning reel correctly. I have scoured all over the internet, talked to different experienced anglers and added my experience in between. So, the forthcoming information is not confusing at all; I have made very simple and very short. You will need a fishing line. Scissor or basically something to cut or trim the line ends. 20 to 30 minutes of your time. Also keep in mind that, the line capacity may not be the same from one reel to another. You will find the line size noted on the front of the reel itself, but all in all, match the line capacity to the reel itself otherwise, you will trouble fishing. Another last thing to note, when putting the line on the reel, the line should come off the package counterclockwise, because it basically goes on the reel clockwise and the opposite is also true. The bail is the little wire arm on the side of the reel that flips up and down. With the bail open, lay your fishing rod and the reel on any flat surface. This is probably one of the necessary steps many anglers usually avoid, but it’s important because if the bail isn’t open at the beginning, there is no way you will be able to turn the spool. If the bail isn’t open at the beginning, there is no way you will be able to turn the spool. The second step is to determine how you will tie the line on the reel. You can use either arbor knot or uni-knot. Through trial and errors, many anglers including I have found the arbor knot to be more efficient, so for the purpose of this article let’s focus on how to tie the line using arbor knot. Determine How will you tie the line on the Reel. Before you begin a tying process, remember that the line coming off the spool should be in the same direction as that of the reel. Start by running the end of the line through the rod and wrap the tag end around the spool, at least twice. Then have an over-hand knot at the end tag, and as the mainline comes onto the reel spool wrap the knot around it, but ensure that the overhead knot has to rest just above the first knot that you tied, so slide it a little bit down. Remember to trim the end tag using the scissors, but ensure that there a quarter inch of the line remaining above the previous knot. If you are using a small line, use an electrical tape to secure it to the reel. Turn the handle slowly with your cranking hand. If you need to add tension, pass the line between your fingers on you casting hand, or if the reel is mounted to the rod you can raise the rod slightly. Place the filler spool and let the line spool off it to the reel. If you have an assistant with you, it will be great because they can supply more tension to the line by putting pressure on the spool. Either way, ensure that the line spool doesn’t flip over or as previously noted make sure it comes in the right direction. Note: this is an imperative step that can prevent the line twist. If you fail to apply pressure, or you retrieve the line loosely, there will be a lot of line loops that leads to twist among other problems. Placing a pencil on the line spool can work, but at times it can create even more twists, so try other methods. If you applied the right thumb pressure, you shouldn’t have problems with twists, but it’s also important that you let the line slack. If there is a twist, your line will begin to unspool from the reel spool; this means you will have to start the process all over again. Apply the right thumb pressure to avoid issues with twists. If your reel doesn’t have a mark showing when the reel is filled, although many usually do, ensure its within quarter an inch of its rim. You can have a 1/8th inch of space depending on your preferences, but whatever you do, ensure that you leave enough room such that you can rub your finger on the line. Don’t let is flush or go over the rim of the reel. If you overfill it, the line will absorb water which can cause a backlash whenever you cast. When you are finished filling, cut the line and if you can put a rubber band on the reel spool, this way the line will remain in place. If you overfill the rim, the line will absorb water which can cause a backlash whenever you cast. And that’s it, pretty simple; you have successfully spooled your ﻿fishing line on your spinning reel. ﻿Something you need to keep in mind, though; there are those lines that have memory, like monofilament and fluorocarbon, so it’s important that you spool the reel-label side up, but for braided lines﻿﻿, you don’t need to do that, but it’s a good thing regardless. If you are interested in knowing the types of fishing reels go here to read more information. Have you enjoyed the tutorial? Well, I hope you have; I have tried to keep everything simple so that everyone can understand. I am a professional angler, despite the fact that spinning reel is easy to use I always had a problem with properly spooling the line to the reel and if you ask anyone else out there they will probably have their idea which is good if the ideas work. Steps mentioned in this article are purely ment on how to spool a spinning reel and don't apply above steps for trolling or baitcasting reels. Anyway, keep an open mind, and get to know what works best for you. One last thing, don’t apply the steps mentioned above for trolling or baitcasting, this tutorial is purely meant on how to spool a spinning reel nothing more. If you are intested in finding out hte best fishign lines for spinning reels then Go here right away. We will have a separate tutorial for other reels. If you have your ideas, Kindly feel free to share with us in the comment section below and kindly share the tutorial with other anglers, that is, if you liked it.